And welcome to a normal, non-ranty, non-meltdown, Sunday 7! I received a great many comments (mainly over on my Instagram post, as well as a fair few direct messages and a couple of comments on the blog) after last week’s ‘to blog or not’ given I am a guilty party in apparently ‘promoting’ fast fashion brands via this blog. More on that at the end. 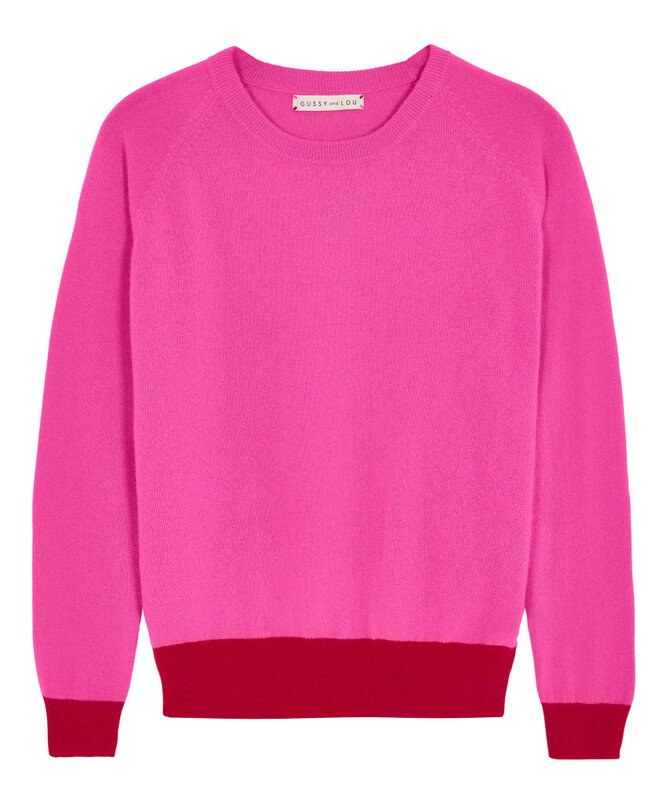 Back to today… the rather chilly mornings and evenings have set in and as such, my thoughts have turned to cashmere. It’s the nicest woolly fibre out there. It’s smooth, it’s soft, it’s warm and often, it’s just as cosy as wearing a real, actual hug. Not all cashmere products are… well, ethical, shall we say. And I’m afraid I haven’t had time to research that aspect of my picks, so I will apologise for that. Anyway, last year I added to my winter woollies with some cheap, H&M quick fixes, which I will of course, be wearing again this year. But in reality, I’m still woefully lacking in the knitwear department and would like to add a couple of pieces this year. Knitwear is the one thing I never mind about being oversized. Most other oversized clothing – coats, blazers etc etc just look stupid on my extra petite frame. And god knows I tried with that look back when I was at uni… buying shirts and hoodies in size XL so they were ENORMOUS on me. But… pleased to report, I’ve learnt from those errors of judgement! This & Other Stories (100% cashmere) sweater appeals on 3 levels: it’s simplicity, it’s price point and of course the neutral, classic colour. However, I’m never certain I can carry camel off very well… washes me out somewhat. It is available in Red, but again… I only feel like wearing red occasionally, so the red is probably not for me. Before you click close tab – fear not: this is not a 50 shades of brown woolly knits edit. This beautifully simple cardi is also available in the ever versatile colours of Dark Grey and Navy as well. I’ve pictured the Terracotta version as it’s a shade I’m forever being drawn to – I blame that on being born in the 70s! I never really use the pockets of my cardi’s… save to stuff a tissue in at certain snotty-nosed times of year of course (yuck, eh?!) but really… why no pockets? To me, the cardigan looks kind of naked without them. 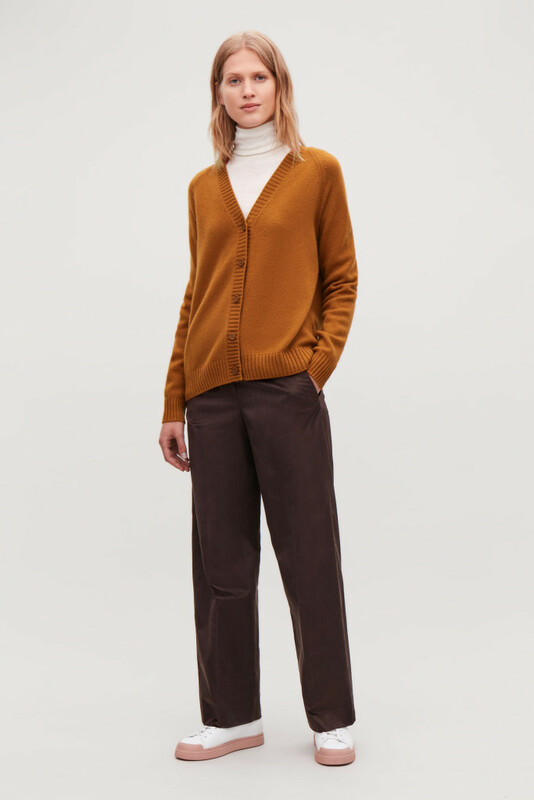 If you’ve see a similar looking cashmere cardi *with* pockets… please let me know. 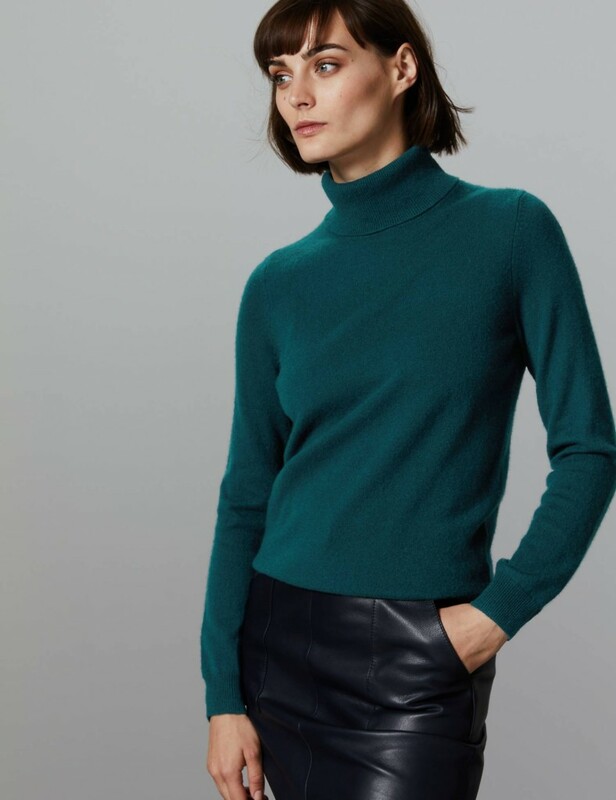 My favourite kind of knit, for when it gets *really* cold – a roll neck. You cannot beat the cosiness of them! 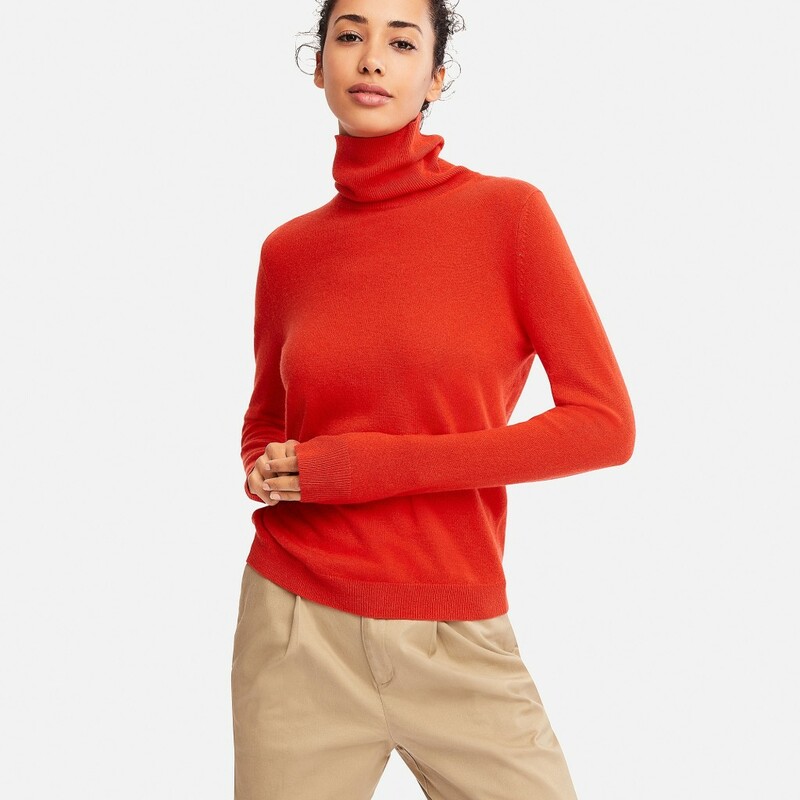 This M&S Cashmere Roll Neck is a good, reasonable price for cashmere, and is available in nine colours. I think I’ve already mentioned: a looser fit with knitwear is only ever going to be a winner in my book. 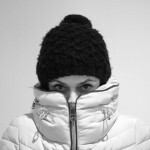 I know – another roll/turtle neck sweater. Do any of you have experience of both? Which is easier to wash? Looking to you guys for a bit of input on this one. 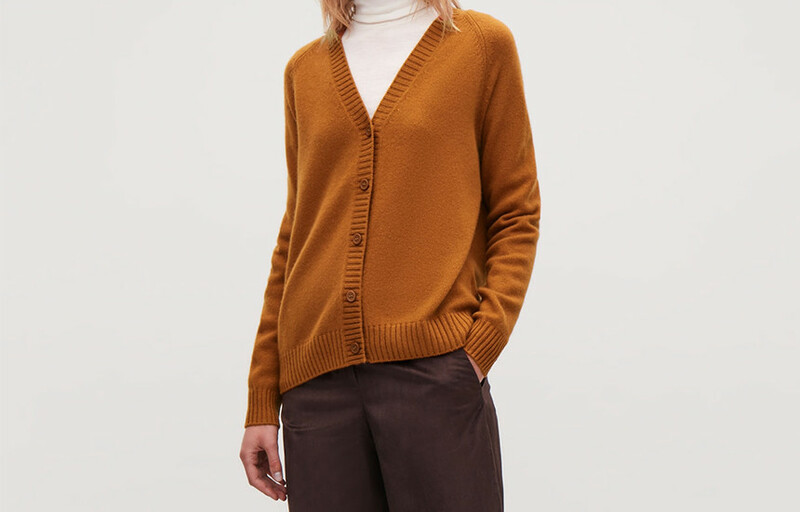 Boden currently have a 25% discount on (from today – until Thursday,) so this cardi would come down to £73.50 which is a pretty good price again, for cashmere. This style of crop cardi (which isn’t overly cropped on us petites) is such a useful style: they look great over dresses, or just as tops and this one is available in 12 colours… so you’d be hard pushed if you couldn’t find one to suit you. The thing is, although I like the 3/4 sleeves… I’m such a cold blooded lizard… I’d need full sleeves. That said, the 3/4 sleeve does open up the opportunity to show off your striped breton or shirt sleeve which is a lovely look, don’t you think? I adore this powder pink knit. But alas, powder pink absolutely hates me. I’m including it in my short-list, because… well.. I just flippin’ love it. But also, it is available in Grey Marl and Navy – the latter of which *is* one of the colours which doesn’t wash me out. So still a possible contender! And saving the best, the loudest and the priciest one for last! But I will say now – I love it! I first came across this brand at the Spirit Of Christmas Fair in 2016 (under their old branding name of Little Leggies), and bought a Neon Fleck Mid Grey sweater at their stall: I can’t sing the praises of the knit enough. It’s kinda true: you get what you pay for. I’m wearing my grey knit today, and although I’ve managed to shrink mine a fraction: it accidentally got muddled in the kids uniform wash – which is one of the loads I always put through the drier as well. However, it didn’t shrink massively – didn’t do that shrunken-felted-wool thing or shrink down to a sweater size only fit for a newborn. But yeah, the sleeves are now a centimetre too short. God it’s one of the most galling things isn’t it? I also have a soft spot for this brand because after meeting Gussy & Lou (albeit briefly) at the Spirit of Christmas Fair, I got in touch with them shortly after and ran my first ever Instagram Giveaway… which, as a fledgling account back then, was a massively big deal for me. From experience of washing and wearing Gussy & Lou cashmere – I really ought to know by now, to save my pennies for one of these. Oh – and yes, I kind of feel l would wear the Neon Pink more than I’d wear red. No idea why – but that’s just how it is. So this is gorgeous, right? Then why is it my Stinker this week? Well… it’s the ‘with cashmere’ bit. However, given the price – of course there’s only a tiny 10% of cashmere; the other 90% being a nylon/acrylic mix. And well, I got a bit over excited and almost bought the knit based on the fact that it’d be a wool-cashmere blend: which is my mistake. But I’m a little irritated with myself for thinking that and so this lovely knit is gonna have to take my ‘wrath’ this week. But… I’ve only ever owned/worn jersey hoodies… never a cashmere/knitted one. And as such, it meets the ‘wild’ criteria I’ve set myself, in that it’s outside my norm. I would have preferred to style the Navy version, but that’s sold out online, so here’s how I’d wear the Grey one. I mean honestly? The names I give these looks sometimes are more than a little ridiculous, and yet… I can’t help myself. So for this casual look (is there any other kind, when a hoodie is involved?!) I’m going double denim, layering a this GAP denim western shirt (£39.95) under the hoodie, shirt collars and hemline showing from underneath. In fact, I’d scrunch the sleeves of the hoodie up, to show the denim shirt cuffs/sleeves off as well. Going for darker jeans, in a more slouchy style with these Gap Mid-Rise Best Girlfriend Jeans (currently £55.96), with a single, large-is turn-up. And as you’re working at home, you may as well get cosy with some Stripy Socks (Gap £8.95 for 2 pairs) and ultimate comfort and warmth as you sit at your desk working, with these Navy Classic Mini Uggs (Office £145). You can of course leave the house in this outfit(!) just chuck your fav blazer over the top – make sure you don’t trap the hood in, at the back. Just make sure it’s not raining… in my experience, wet uggs are gross! 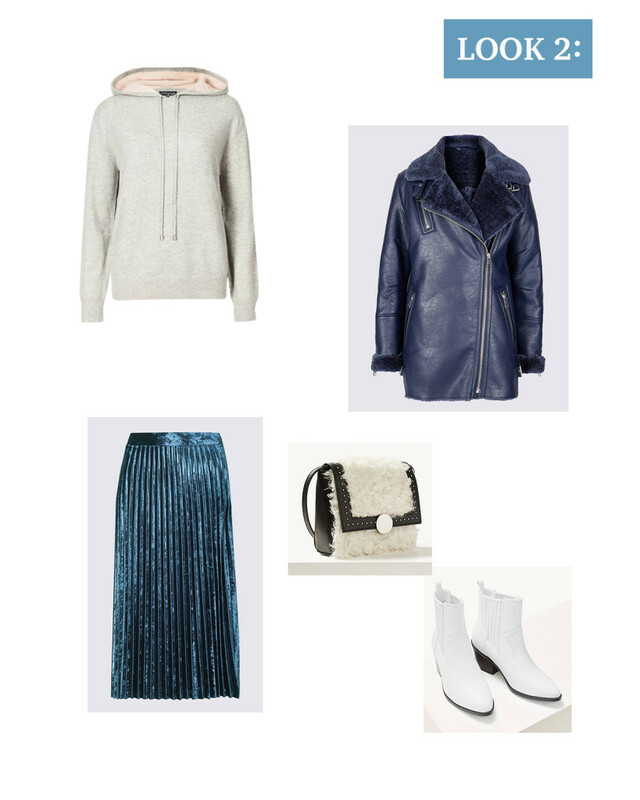 If you don’t mind wearing a pleated midi skirt at this time of year, how about wearing one with your slouchy hoodie? This M&S Velvet pleated midi skirt (£35) is such a beautiful colour and mixing the velvet & cashmere textures would look very luxe. 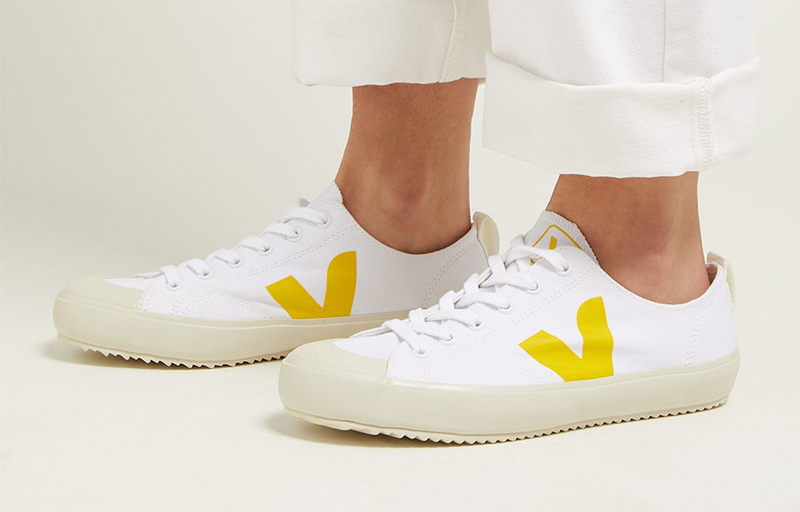 Now you could go for white trainers, but why not a pair of White Block Heeled Western Boots (M&S £45) instead? Or is that one bit of faux shearling and texture too far?! A rare ‘at home’ Sunday, one where you’re not going to leave the house AT ALL. So why not go for the ultimate comfort with some Cashmere Joggers (again M&S – £99) and some cosy John Lewis Cable Knit Socks (£16)?? Grab a hot choc in this cute H&M Porcelain Mug (£6.99) and curl under this rather lovely leopard print H&M Blanket (£24.99) whilst you put your favourite old flick on from Netflix. That’s it for this week… now whilst I didn’t bother to put the layering tops in for looks 2 & 3, I would be wearing a tee, a turtleneck heat tech, or a shirt under the jumper. And back to last week and your comments. The overall consensus was that most of the time, people who read my blog, enjoy my styling idea’s and take style inspiration from my musings rather than seeing me as promoting a ‘must buy’ ethos or sell-sell-sell vibe. As I would miss not writing this weekly blog – even if sometimes I feel as though it’s one thing too many to do. The reality is, once I sit down and start tapping away, it’s a really great way for me to block out the white noise of my daily grind for a couple of hours. 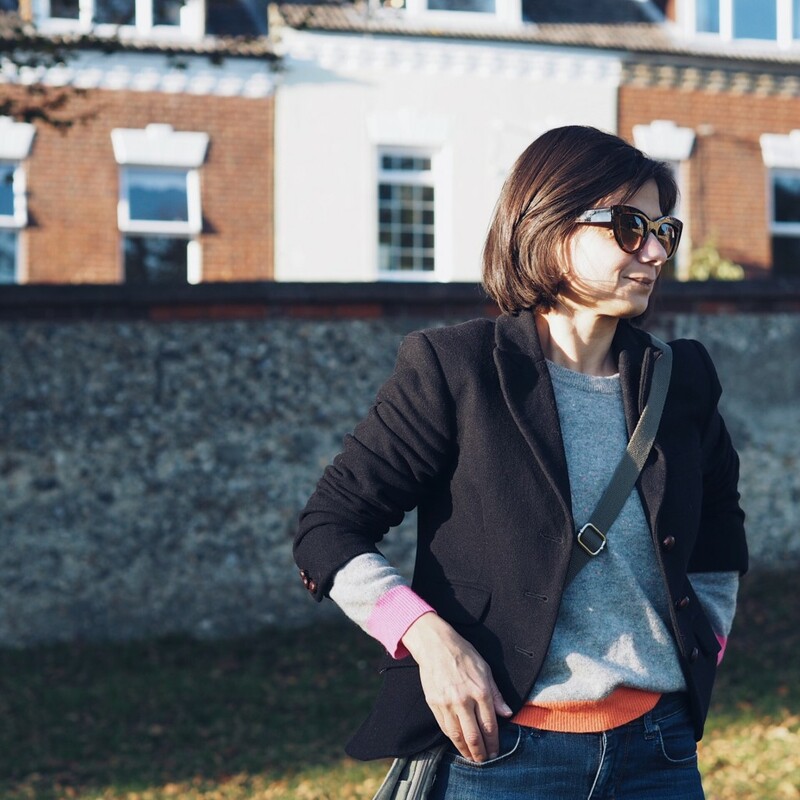 I enjoy sharing my own fashion tips & styling although I realise that I probably don’t have the most adventurous personal style… the thing about blogging, which I’ve found… is that you can’t be all things to all people. I am who I am, I like what I like… but I’d be lying if I said I was ‘over’ the guilt of fast-fashion brands. I’m still mulling over exactly how to introduce more preloved / sustainable & ethical brands and clothing – to ensure that I’m not just paying lip-service to the topic, rather to ensure it becomes a regular feature. Thanks for reading & hope to hear from you in the comments below. The cashmere hoodie is on my wish list, in navy though too! I managed to shrink my Bella Freud jumper in the dryer, that was a bad day! Mine too Melissa – and a pair of cashmere joggers, although there’s a danger I’d never wear anything else!